Heads up bluegrass lovers!! Here’s an event you’ll not want to miss!! 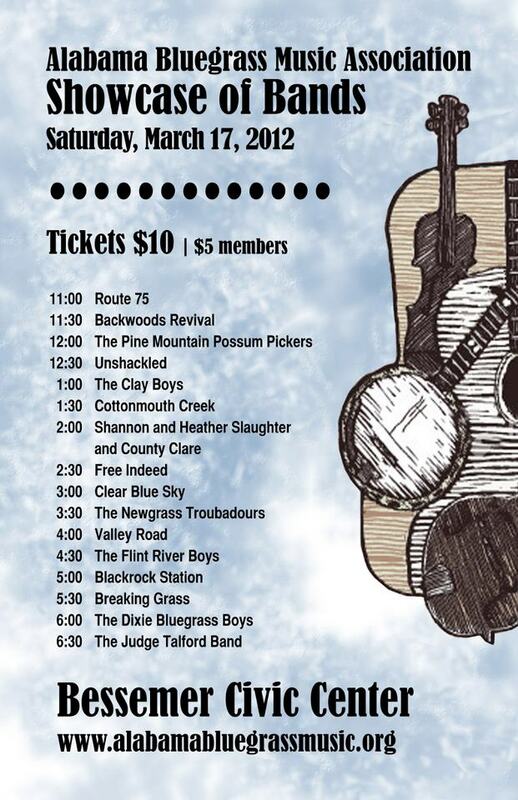 The Alabama Bluegrass Music Association will feature some of the best bluegrass bands in the state at their Showcase of Bands. It’s happening this coming Saturday, March 17th from 11am to 7pm at the Bessemer Civic Center. You’re invited to bring your instruments and jam with other musicians! Admission is $10, or $5 if you’re an ABMA member! Click the poster on the right for a larger view and see the list of bands!! You won’t find any green beer here!